Each year about this time we start to transition from the winter flus to the spring allergies. And with the allergy season comes the sneezing, itchy eyes and runny noses – and the need for an unending supply of facial tissue. With this in mind, I recently spotted a newcomer in the facial tissue category: Sniffles Pals. 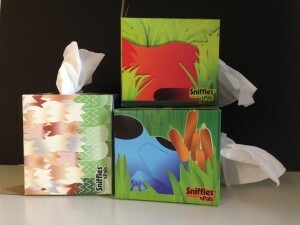 Sniffles Pals is an animal-themed facial tissue package concept that appears to be targeted to children and/or animal lovers. The surface graphic design is very well done, using bright engaging colors and bold simple designs of a fox, owl, and a frog. Although the designs are lovely, it is also where the packaging concept seems to falter. 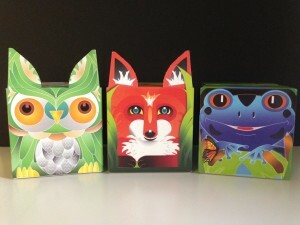 The package structure initially seems unique because the ears of the fox and the tufts of the owl have been die cut out of the side panel flaps of the carton and engineered to stand upright. This creates a dimensional extension to the faces of the animals, but the actual perforated carton opening (where you think it should be) seems to be missing. Most consumers have been trained to treat what has become known as an “upright” or vertically oriented carton as just that, with the tall side of the carton standing up and the square, stable panels of the package creating the top and bottom. The package opening is centered in one of the square sides of the package, becoming the top of the package. That way when you pull a tissue from the carton, the weight of the tissue in the carton helps keep the carton upright as you pull a tissue out. In the case of Sniffles Pals, based on the graphics orientation of the carton, the carton opener location is confused. If the opener is supposed to be on the top of the carton then the location of the faces and features of the animals are positioned on the underside of the package obscuring their features. If you put the face and features of the animal on the top of the package, then the package opening is on the underside or bottom of the carton. In this case, after you open the carton and remove a tissue, it makes it impossible to keep the carton straight because exposed tissue disrupts the ability of the carton to sit up flat. So deductively, it appears that the designer is asking for you to break with all tradition and without aid of instruction, and intuitively use the carton on the horizontal axis instead of the vertical. OK, assuming that the intent is to lay the carton on its vertical side so you see the face of the animal, it positions the opening of the package on what is now the “back” side of the package, sticking out of what is implied as the animal’s bottom side. This may be OK for the fox and owl that have tails of varying sizes, but it doesn’t work for the frog at all. I have to believe the designers of these packages, while using the side panel folds to create the opportunity for unique die cuts to create enhanced animal features, neglected to consider the years of conditioning consumers have undergone to keep the carton naturally upright. I highly value creativity and I appreciate the effort this firm made to go in a new direction with a facial tissue carton, but I think that the engineering of the carton needs a little further consideration. I recommend the manufacturer consider one other factor. While the bright and colorful graphics drew my attention to the shelf, the cartons were scattered all over because people were looking for packages where the die cut features had not been bent or folded. The design and engineering teams might want to consider a poly overwrap like the other branded facial tissues, to keep the carton intact until it is in the possession of the consumer. Not only will it offer protection for a unique carton concept, it will provide a means to instruct the consumer on the correct use/orientation of the unwrapped product once the wrapper is removed. This is a great start from Sniffles® Pals. It is a cute idea, however, I believe the package structure and orientation asks a lot from your typical facial tissue consumer. If this is targeted to children, it is positioned on the top shelves of the store where children cannot see or reach it. As a normal height shopper, I had difficulty extracting three usable cartons from the shelf. I also think they should consider some sort of free standing display to introduce and promote the product before abandoning it to a poorly tended shelf where it gets lost in a sea of competitive cartons.